Several years ago I wrote an article for a local newspaper about an animal rights issue and was bombarded with brutal attacks from readers deriding me as a “card-carrying PETA member,” as if that designation qualified me as someone not to be trusted or believed … or even heard. Puzzled by the McCarthey-esque appendage, I checked my wallet to verify. Yes, there it was: my PETA membership card. That surprising fact confirmed, I attempted to figure out why we PETA members are so routinely condemned out of hand. PETA (People for the Ethical Treatment of Animals) remains one of the most successful animal rights organizations in the world. With more than 2 million members and supporters, it is the world’s largest, but also one of the most controversial — with probably the biggest target on its back. Just the mention of its name can elicit derogatory comments and create silent enemies. So why am I a member and why is it so controversial? I’m a member because PETA is the most successful animal rights organization in the world and I believe in what they do. Through public education, undercover investigations, research, animal rescue, lobbying for legislation, protests and other campaigns, they seek to improve the lives of animals — all animals. They seek to educate people by changing minds about animals and how we humans treat (and mistreat) them. That is a noble ambition and a worthwhile cause. They are controversial, I believe, in part because people confuse them with more radical groups such as the Animal Liberation Front, and partly because of their deliberately provocative ad campaigns designed to attract attention and make people rethink their habits and actions. I tend to ignore the marketing hype — as I do with most things — and focus on the goals and purpose of the organization. Titillating nearly-naked celebrity ads promoting vegetarianism neither convinced me nor dissuaded me from choosing a meatless lifestyle. Often, a significant event causes a person to make a drastic change in lifestyle. The same year that Ingrid Newkirk founded PETA, I was a teenager who gave birth to my only child. Having always been an animal lover, my role as parent and protector of this innocent life suddenly changed my perspective on the lives around me. As I drove around the rural Midwest, I noticed four-legged mothers with their babies. It seemed to me those mothers loved their babies every bit as much as I loved mine. It was enough to inspire me to become a vegetarian. But it wasn’t until years later that PETA began seeping into my vocabulary, and even longer before I became a member. It wasn’t until I moved away from my very small hometown and began to experience a broader world that I realized the actions of a single person could have an impact. I started sending a small annual amount of money to PETA and a few other organizations, such as the APSCA, HSUS and WWF. I began buying products that weren’t tested on animals. Eventually, I stopped wearing leather — which wasn’t as difficult a transition as I had expected. I adopted animals from shelters and rescues instead of purchasing them from pet stores. But I remained secretive and almost apologetic about my PETA affiliation, embarrassed by the backlash, the questions and the criticism. Conversely, the more I read, saw and experienced, the more committed to PETA I became. When business was good, I increased the size of my donation. 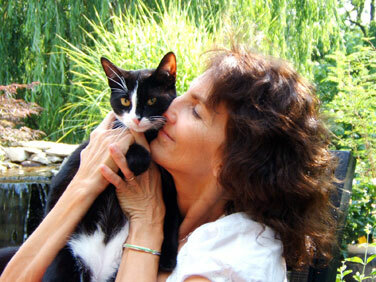 When I suffered the loss of a companion animal, I made an extra contribution as a memorial. When business was bad, I eliminated donations to other causes in order to continue being able to afford contributing to PETA. I even became bold enough to put a PETA sticker on my truck window, for all the world to see. But the only time I attended a PETA protest was as a journalist. I was horrified by the verbal barbs slung at these peaceful protestors. I agreed with everything they stood for that day and was impressed by their cheerful demeanor in the face of verbal assaults. That doesn’t mean I blindly follow PETA’s dictates, as I have been accused of doing. I don’t agree with every tenet. I challenge all PETA detractors to honestly evaluate their chosen religion, political party or any other organization they support or group they belong to: few outside of the founders will agree with every single line item. And yet, there is enough basic agreement that people continue to support causes and affiliations. Already a loyal PETA member, it wasn’t until I met Ingrid Newkirk, co-founder and CEO, that my real commitment began. Our initial relationship was professional: an interview in which I asked her the questions that were so frequently hurled at me: why did she kill so many abandoned pets? did she support ALF? was this truly a non-violent organization? Satisfied with her responses, I listened to her talk about animals. As we became friends, she shared with me some of the horrors of animal abuse and neglect she regularly encountered on her travels and in her investigations. I heard the sorrow and compassion in her voice. When we spent time together, I watched her politely interact with people and gently persuade them to be kinder to animals. This woman didn’t just talk the talk, she walked the walk. Every day and every encounter was an opportunity to change minds, to make life better for all animals. I continued learning from Ingrid by reading her books, my favorite of which is Making Kind Choices, an eye-opening guide to easy alternatives for everyday products that don’t involve animal cruelty. Another simple lesson I learned was to use different language when discussing animals. It makes a difference. I no longer call myself a pet owner; I am an animal guardian, an animal caretaker. A subtle shift like this changes one’s outlook. Animals have an inherent worth completely independent of their “usefulness” to humans. We have no intrinsic superiority that grants us authority to harm them for our benefit. Instead, we have a moral obligation to protect them. Legally, the animals who live with me are still considered my property, but by viewing them as living, thinking, feeling beings with unique personalities and individual lives to lead, I treat them differently — and I believe others would treat the animals in their lives differently if they looked at them this way. PETA has been enormously influential in introducing such revolutionary, yet basic, ideas to the world. Their credo is simple: animals are not ours to eat, to wear, to experiment on, to use for entertainment or to abuse in any way. Animals have a right to live free from pain and suffering. People often ask why animals should have rights, using exaggerated arguments against animal rights by bringing up ridiculous notions of animals voting or humans marrying animals. According to Peter Singer in his ground-breaking book Animal Liberation, the basic principle of equality doesn’t require identical (equal) treatment; it requires equal consideration. Animals have the same ability to suffer as humans do. They feel pain, fear, loneliness, happiness and love, just as we do. We have no right to inflict pain or neglect their needs. No longer afraid of the reaction to my support of PETA, I now distribute their Vegetarian Starter Kits and express my opinion, publicly and privately but always politely, about hunting, fishing, circuses and zoos, laboratory testing, hoarding in the name of rescue and animal rights as well as animal welfare. In the end, my rebuttal to all those who question my PETA affiliation is: what do you have against treating animals ethically?